How to attribute Creative Commons licenses to images using the Xpert tool from Digital Dance Archives on Vimeo. The e-learning packages uploaded onto JORUM have been linked from MERLOT (Multimedia Educational Resource for Learning and Online Teaching). The video “A Language for Movement” (produced by the BBC for The Open University) and its transcript are also available from JORUM and MERLOT. This programme focuses on dance notation and reconstruction. The first two e-learning dance packages are now available in Jorum. Instructions for students. Two documents with instructions about each of the e-learning assessment tasks: The Artist’s Sketchbook: A Process Space and the Reflective Commentary. Resources list. Recommended readings and audio-visual materials. A sample of an Artist’s Sketchbook by a student. A list of additional tasks that can be linked to the Artist’s Sketchbook and set as homework. These can also be worked on in class/studio as appropriate. Two academics from the project team will be attending the OER13 conference in March to present the paper “High aspirations: Transforming dance students from print consumers to digital producers” based on the experience of implementing e-learning in the dance programme. This Sunday, 16th December, Creative Commons licences will be celebrating their tenth anniversary. To mark this occasion the CCC:EED project will be launching an awareness campaign in the Dance department. The project team will be also producing a tutorial on how to use the Xpert tool for searching open educational resources and attributing images with CC licences. This week the CCC: EED team is gathering feedback from students on the project’s e-learning packages. Arts and Society and Ballet students met today to discuss their experiences working through the materials. Two postgraduate students and one student in work placement are acting as critical readers to all the online resources created for the dance programme. This feedback will be used to inform the final version of the materials which will be soon share with the dance community via JORUM. Students postings on a digital wall as part of the e-learning collaborative activities for the Arts and Society module. This week e-tutor met with academic staff to discuss e-learning within the new VLE. The selected modules for the CCC:EED project are looking into an effective implementation of blended learning that makes a greater use of module websites. Topics discussed at the meeting were: student engagement and VLE activity, design and timing of online materials, copyright issues and appropriate use of Creative Commons licences as well as contribution to Open Educational Resources. Final thoughts were dedicated to consider ways of disseminating this e-learning experience within the Faculty of Arts and Human Sciences and other institutions. What has the CCC:EED project done for us? From the teaching and learning perspective, academic staff have been able to reflect upon and revise the content, teaching methods and assessment of dance modules in a blended fashion. 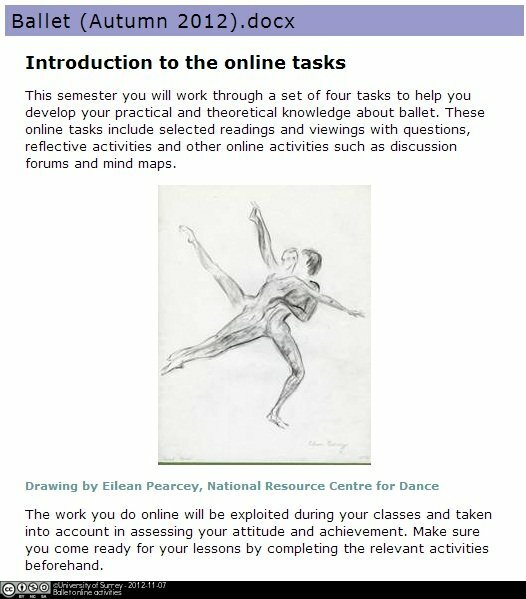 This educational review has enabled the implementation of online independent and collaborative learning for dance students and it is facilitating the transformation of the VLE as a common space for module activity and communication, including easy access to relevant library resources. The project has encouraged student engagement with technology as part of their formal studies (both inside and outside lectures), fostered creativity and motivation through the use of different technologies and digital tools, and has increased digital literacy amongst both staff and students. All of these aspects will make possible new ways of delivering teaching and engaging students in the future. The lessons learned through the development of these dance modules which blend online and classroom activity will be used to reflect upon and inform delivery of other subjects within the School of Arts. For the NRCD and its archives, the project has improved knowledge, systems and documentation for digitisation processes, created a mass of new digital content for use in current and future resources, allowed for dissemination of archive content which in turn should raise awareness of the potential of NRCD archive content for teaching and learning and hopefully increase use of the collections. The CCC:EED project team have been awarded a grant by The Higher Education Academy for a seminar on “Integrating e-learning to foster creativity in Dance Studies”. This will be one of nine seminars and workshops for dance, drama and music between now and July 2013. This seminar will take place at the University of Surrey on Tuesday 22 January 2013, and will provide opportunities for networking and discussion. Delegates will learn about how the CCC:EED project has engaged with assessment for reflective learning and with a pedagogical review on the part of the academic staff that focuses on a more active participation of students throughout their studies.